How does a prosecutor who committed crime stand in front of a court and ask a Judge to sentence a convicted criminal? That is the confusion surrounding Angela Wetzsteon in Hamilton Montana. Prosecutor for the Ravalli County Attorney Office. Ms. Wetzsteon practiced law in a Ravalli County Courtroom on August 8, 2007 unsupervised. The problem is, she graduated from Montana Law School in 2008, and was admitted to the Montana Bar on October 9, 2008. 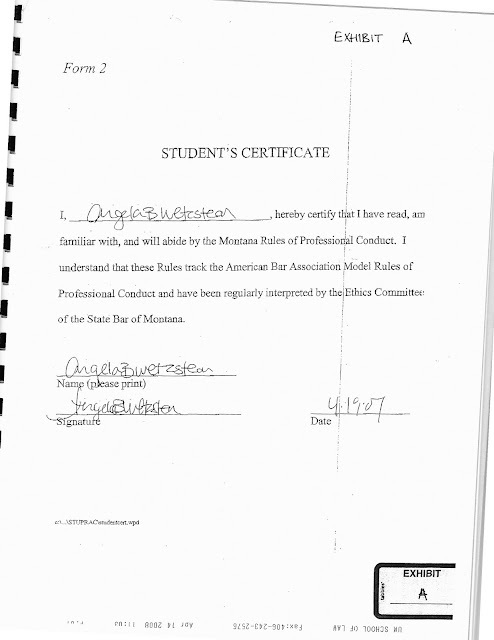 This means Angela Wetzsteon practiced law without a license in violation of the Montana Student Practice Rule, an order from the Montana Supreme Court (#12982). Violation of a court order is a crime, criminal contempt Montana Code Ann. MCA 45-7-309(c). If you do favors for the right people in Montana, you are protected. The current county attorney, Bill Fulbright was supposed to supervise Ms. Wetzsteon, and didnt. Here is a video given to Bill Fulbright to prosecute unlawful activity of law enforcement. As long as the law enforcement is going after the right people in Montana, they are protected. Bill Fulbright is Angela Wetzsteon's boss, ran for office on upholding rights. The Montana Law school where Angela Wetzsteon is a 2008 graduate will not meet with the public, did not respond to an American Bar Assn (ABA) comprehensive report about Angela Wetzsteon '08. A $40M expansion was finished to the Montana Law school due to Angela Wetzsteon, and her criminal act August 8, 2007. The old law school entrance can be seen in this video which we dedicated to Angela Wetzsteon's unauthorized practice. where criminal activity is our motto, and we allow violation of Constitutional right. University of Montana Law schoool. While Angela Wetzsteon's law school ranks 172/200 ABA approved law schools (to commit crime) it will never outlive the criminal act of a law student practicing law unsupervised. It is a wonder that Angela Wetzsteon can wake up in the morning and look in the mirror. The cold, calculating BS that crime is OK in the justice system if the target is approved. 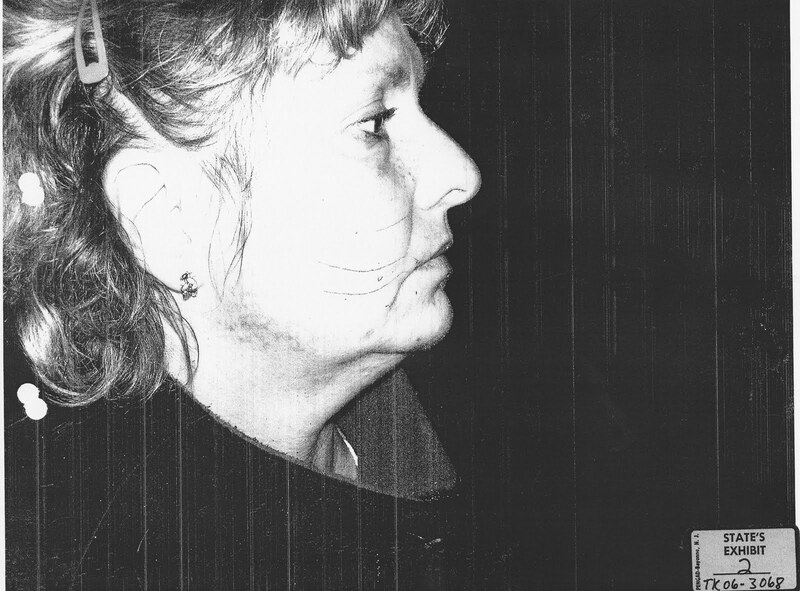 A candidate for Governor in 2012 Steve Bullock helped to protect the criminal practice of Angela Wetzsteon. He is required to not help any person practice unauthorized via ethical rule 5.5 in Montana. It goes furhter than Steve Bullock. The Montana Supreme Court violated their own order for Angela Wetzsteon. The Montana Justice system selects and chooses who can commit crime. Has anyone noticed that Mike McGrath has gained about 50#----ITs called GUILT. Do Montana residents wonder why we are last for economy, last for justice? When officials pick and choose who gets a pass for criminal behavior, and $40M law schools are rewarded for Angela Wetzsteon's unlawful conduct, there is no justice in sight. Like I said about George Corn, available www.GeorgeCorn.com IT IS ONLY A VICTORY WHEN YOU PLAY BY THE RULES. Angela Wetzsteon said she would uphold ethics, and did not. TAMPERED EVIDENCE. entered into evidence after the discovery deadline. Spreadbury was standing to this woman's left. Right cheek scratched. Tampered evidence is supposed to be a felony crime. Not if you are law enforcement in Ravalli County Montana. Ethics decree by Angela Wetzsteon.....that means nothing. Angela Wetzsteon is lawless, but "upholds the law" in Hamilton Montana as a prosecutor. look for the website www.AngelaWetzsteon.com soon. It will give a chance for Angela Wetzsteon to give up her law license, in exchange for taking down all posts about her on the internet. Pretty Good Deal for Angela Wetzsteon.